PureousTM Heavy Metal Fix targets heavy metals using molecular modification technology to render unwanted heavy metal contaminates safe. This offers the advantage of safer and more economical options for handling and disposal of heavy metal contaminated waste. 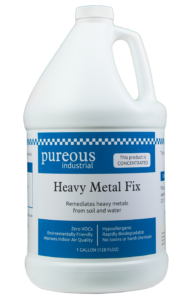 PureousTM Heavy Metal Fix is a specifically formulated liquid for the remediation of heavy metals such as lead, zinc, chromium, copper, calcium, cadmium, and other multi-valent metals. In all cases of treatment, the final product is an inert, non-absorbable material that will not cause further biological or other environmental harm to the area. The metals are bound in a nonleachable form that can pass TCLP and SPLP testing from regulatory agencies.